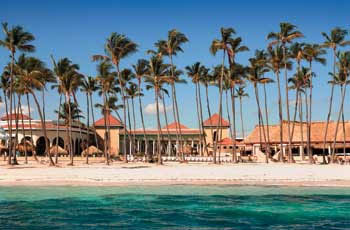 Paradisus Palma Real Review: At the peak of luxury and elegance sits the Paradisus Palma Real. Nestled in tropical mangroves and lush gardens this world class resort extends paradise from its natural surrounding to its state of the art resort. Located directly on the beautiful white sands of Bavaro Beach and 25 minutes from the Punta Cana International Airport, Paradisus Palma Real is ideally situated for the guest looking for paradise on their vacation. Paradisus Palma Real’s commitment to elegance and style will leave you breathless. Paradisus offers unlimited green fees at the Cocotal Golf Course and Country Club as part of their all inclusive package. Paradisus also offers a Spa that focuses on your well-being, using the four basic elements, air, water, fire and earth to help you achieve complete inner and out peace. Dine in elegance in one of seven restaurants dedicated to serving high quality and delicious food in a tasteful atmosphere. Stay in the exquisitely appointed, five star quality guest rooms. Take part in one of many different activities offered at the resort. Paradisus Palma Real offers a variety of activities for everyone, including the avid hobbyist. Paradisus Palma Real Review Kids Club: Children are pampered just like their parents at the Paradisus Palma Real Resort. The Family Concierge is available instantaneously via walky talky to help coordinate activities for the family above and beyond the kids club which is also available at the resort. Choose the family Concierge package and watch as your children delight in the delicate details designed directly for them. Paradisus Palma Real Review Accommodations: The Suites at the Paradisus Palma Real are defined by their attention to detail and dedication to luxury. Suites at the Paradisus are spacious and beautiful. 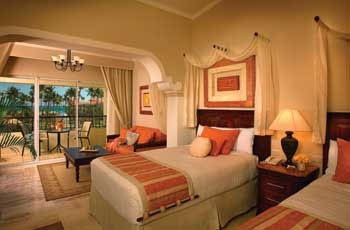 Jacuzzi tubs and flat screen TV’s are standard in the suites at the Paradisus Palma Real. Details to delight guests include 400 thread count sheets, fresh flowers, bathrobes for adults and children alike, and on and on. Beautiful views and rooms that pamper make the Paradisus an excellent choice for the sophisticated traveler and their whole family. Paradisus Palma Real Review Golf and Spa: Unlimited Green Fees and special club privileges at the Cocotal Golf Course and Country Club are afforded to guests of the Paradisus Palma Real. Cocotal Golf Course is a championship course designed by José Pepe Gancedo. Lessons are available. Golf Enthusiasts will love this vacation package. Replenish your Energy, Revitalize your Skin, and Feel Younger! The Spa at Paradisus Palma Real invokes the powers of earth, air, fire, and water to sooth your weary soul. Replenish your energy, revitalize your skin, and feel younger, healthier and ready for what life has to offer you after your time at the Paradisus Palma Real Spa. Paradisus Palma Real Review Restaurants and Bars: Fine cuisine and unlimited premium brand dinks compliment the all inclusive package at the Paradisus Palma Real beautifully. Savor the variety and quality of the food, freshly prepared by the excellent Chefs of the different restaurants and buffets of the Paradisus Palma Real in Punta Cana. 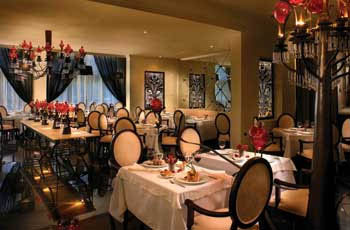 To ensure a classy atmosphere, guests are asked to dress for dinner at the restaurants of the Paradisus Palma Real. Men are asked to wear pants and closed toed shoes while women are asked to not wear jeans. Depending on the atmosphere you desire, restaurants at the Paradisus Palma Real are sure to satisfy. Sushi, themed Martini bars, a Bellini bar, Asian fusion, Mexican and a poolside buffet serve as appetizers to what is a full menu of dining delights. Guests are served a variety of international and premium brand drinks from a variety of bars throughout the resort, including two pool side bars and swim up bar, disco lounge bar, piano lounge bar and casino bar. Guests may choose from a selection of international wines at dinner in one of the many restaurants at Paradisus Palma Real in Punta Cana. Paradisus Palma Real Review Activities: The activities at the Paradisus Palma Real are designed to suit an eclectic group of people. Everybody from the athlete to the hobbyist to the relaxing sun seeker will find what they are looking for at Paradisus Palma Real. Unique to Paradisus Palma Real is the opportunity to fine tune your palette in the wine taste testing forum. Expand your understanding of Zen Philosophy or fine tune your eye in the photography workshop. Tennis and Beach Volleyball among other activities will get your body moving. Take full advantage of the ocean by experiencing any number of water activities available. Adventure in one of the motorized or non-motorized water crafts and explore under the Sea of the Caribbean or on an excursion of your choice. Exhilarate in the wild ride of kite surfing. Motorized water sports are available for an additional charge. Paradisus Palma Real Review Pools: The resort offers three large free form pools including one directly beside the beach. You will find a swim-up bar and two pool side bars available to you during your stay. Paradisus Palma Real also offers two pools for children. Private shaded lounge areas, towel service and a tropical surrounding make for a fantasy getaway at Paradisus Palma Real in Punta Cana. 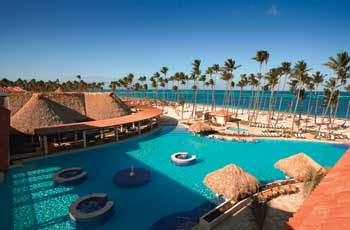 Anxious for your trip to Paradisus Palma Real Punta Cana? Hit any of the "Get Quote" buttons on the page and we'll send you a booking confirmation form or give us a call toll-free and we'll answer any questions you may have. Let's make that dream vacation a reality - join the All Inclusive Resorts Family. Do your own Paradisus Palma Real review this season!